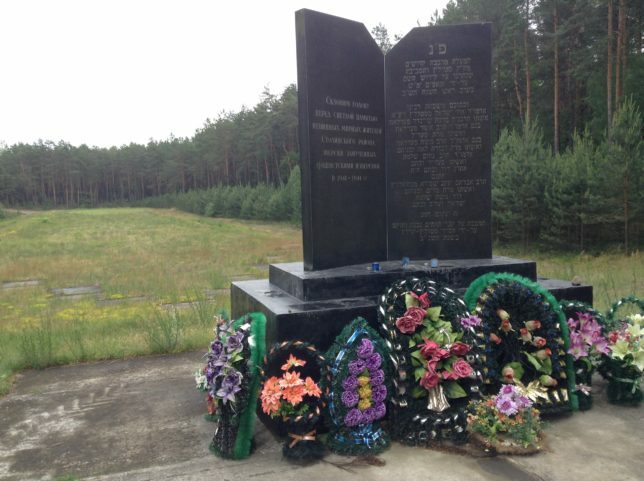 One year ago last week I stood at a Holocaust grave in Stolin, Belarus. However, it has taken me until now to be able to put words to that experience. That summer of 2016 was the 75th anniversary of World War II’s impact on Belarus, when they lost about a third of their population. This was due to the fact that the fighting armies swept through their country twice during the war, and also because a large percentage of their population was Jewish. Our guide on this visit to the memorial was a Belorussian descendant of one of the Jews killed in Stolin during the Holocaust. This man explained the history of the places we stood and told us stories of what happened there. Our guide took us down the Road of Death, the path the Jews were forced to walk down to where they died. The paved portion of this road had not been repaved since that time; the surface we passed over was the exact same place that the feet of the Jewish people had stepped. Those living in the town during the time of the war questioned why the prisoners walked willingly down this road rather than escaping from the Nazi guards. The story that went around then was that the Jews wanted to take this march to their death. However, the truth was that none of them wished for this, yet no one had enough strength left to fight back or try to escape, and the few who did start to run were quickly shot. There was nowhere for them to hide or find safety. The only choice was to go where they were told. The road went out of the town, through open grassy areas, and down into a wooded place. There were lots of trees on both sides of us, fairly densely packed. Not as much sunlight got through the trees, though there was a path cut into them where we went through on the road. Then suddenly, to the right, there were no trees. This huge expanse was etched into the forest as though by some rigid knife. It was flat and straight and wide, and seemed to stretch out infinitely. The air seemed still, and heavier in a way, but not thick...there was nothing there. Our guide told us how the clearing we were standing at the opening of was dug down 9 feet deep when the Jews were here. The Nazis would line everyone up around the perimeter of the opening and shoot them in the back, making them fall into the grave. This went on until the Nazis decided that it wasn’t worth wasting their ammunition killing these people anymore, so they simply shoved them in on top of the other bodies and left them there to die. It was said that you could see what looked like the earth rolling and creeping as they all slowly wasted away. 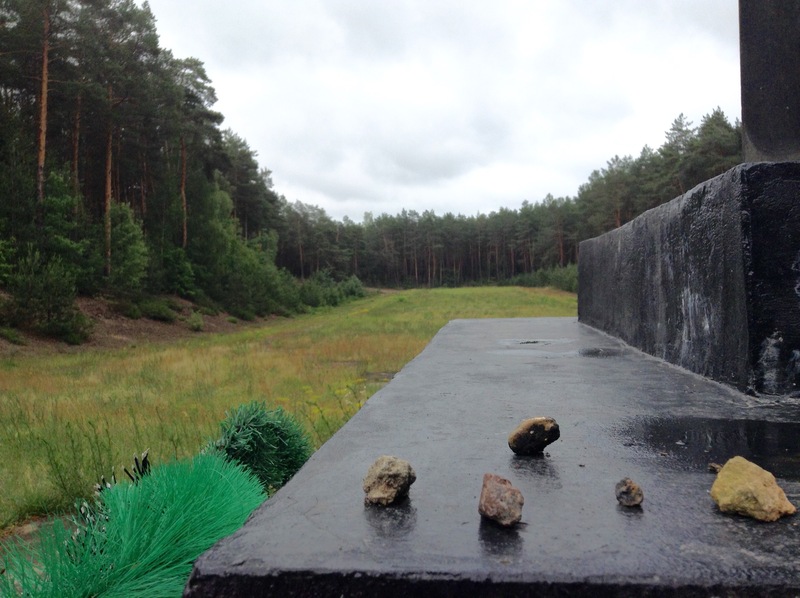 Before leaving the grave site, we placed a stone there in the Jewish custom as a memorial. The next morning after visiting the Holocaust memorial, the team of people I was with in Belarus all sat down together so we could discuss what we had seen, heard, and felt. I was glad for this. It had been a heavy day, a lot to process, and it was hard for me to figure out what to take away from it. I could understand why these people would feel hopeless, abandoned, forgotten, and defeated. You could literally see the hurt and devastation that cut into their world. How do you ignore such blatant tragedy? But what could you ever do to fix it? Our group leader asked some of us to share what we noticed at the grave. One girl close to my age talked about feeling anger at the wrong that had been done in that place. Someone else said how sad they felt, and I resonated with that feeling... I could still feel the heavy emptiness to the air around the grave, and see the void in the trees that was like an endless chasm where all the life got smothered out. It was huge. It was vacant. Yes, sad is right. But then one of the ladies on the team started talking about how she was struck by the beauty of the place. I didn't know what to make of that statement... She said how she heard the birds singing and she was captivated by the green of the trees and grass, how the earth had regrown over where the people were buried and God had brought new life into that place. Suddenly, that expanse I had been standing in looked less like a mere field and more like my life... There was this gaping hole in the middle of everything. My life didn't go the way it was supposed to. Things happened that were too wrong and too devastating, and there was no way to undo it. You can't go back. But what if you don't have to? What if instead, God just brings in new life to restore what was broken? Maybe it means that everything doesn’t have to go back to the way it was before bad things happened in order to be okay again, to be good even. Perhaps the here and now can still be beautiful, without denying the truth of the past. We can see the tragedy in the past, but we also see the hope of what God is doing now and what He will do in the future. Our leader spoke again, and he recalled how our guide said the Nazis spread the idea around the town that the Jews had wanted to be slaughtered like they were. Of course that was a lie; no one would volunteer to die in that way. Yet one person in history did willingly walk to a death just like that... Jesus went to the cross for our sins like a lamb being slaughtered. He did choose that for us, to redeem our brokenness. And the crucifixion was a terrible thing! That was the worst thing ever in history to happen, but through the horror of it all, God produced His most amazing work: the salvation and redemption of our souls from sin. "God allows what He hates to accomplish what He loves," another team member summarized. It doesn't make what happened in the past wonderful, but it means that it is not hopeless. As big as the tragedy is, the grace and hope that Christ brings is infinitely greater. God breathes new life back into us, even in the chasms and shattered places. His purpose wasn't to undo our sin or our pain, but to redeem us and everything that has happened in our life: to put new purpose and beauty into it. The expanse of that clearing is still there in the field of Stolin, Belarus. The bones of those who died there in the Holocaust are still under that ground. It will remain that way too, none of it can be taken back, and it wouldn't be right to cover it up and pretend like it never happened. The mark of that wound will remain, but it will not always remain as pure devastation. The birds do sing there, the flowers and grass do grow, and baby animals have been born and grown up in that place. New life has sprung up even in the midst of the brokenness, and it would be wrong to ignore that and act like it never happened. Both things are real, the pain and the restoration, but they are not both the end of the story. It is okay to remember the tragedy and even to mourn it still, but never at the cost of forgetting what God has done and is continuing to do in and through it all. Let your tear-filled eyes still lift to the sky... and see the sun shining.